The Basque Culinary Center building, completed in 2011, stands on a hill in the Miramón Technology Park. 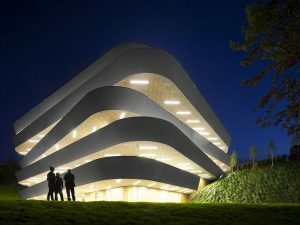 Designed by the VAUMM studio, the building organically integrates with its surroundings, making the most of the hill slope to organise the interior space from top (access, restaurant, etc.) to bottom (classrooms and laboratories).